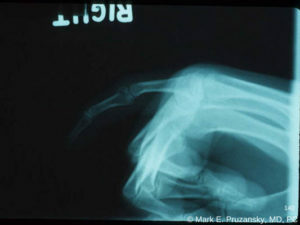 Phalangeal fractures are, in layman’s terms, finger fractures. These can occur to any of your fingers and can affect any of the phalanx bones of your fingers. Greenstick fracture: the bone bends and cracks, but is not completely broken in a child. Compression fracture – a common type of phalangeal fracture where the bone is crushed, such as if it has been slammed in a door. Joint Fracture: a serious disruption of one or both boney articular surfaces. In some cases, a patient may not immediately be aware that they have a phalangeal fracture, depending on the severity of their injury. Since fingers are often jammed or slammed in doors or slightly injured, a patient may have a small fracture that they may assume is simply a sore finger after an accident they deem minor. If you are experiencing finger pain after an accident, it is important to be seen by a hand specialist who can examine your finger and determine whether or not a phalangeal fracture is present. Some types of phalangeal fractures are more obvious, such as when the finger appears obviously deformed. 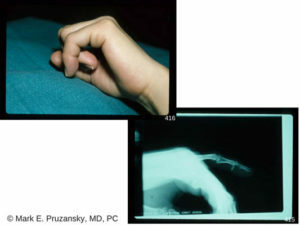 Following an accident, a finger may become swollen and unable to move. In these cases, nerve function and blood flow may also be obstructed so it is imperative to seek care from an experienced hand specialist like Dr. Mark Pruzansky or Dr. Jason Pruzansky to minimize lasting damage. Our fingers are used throughout the day and in almost every activity that we do. This makes them especially prone to injury. Athletes can fracture their finger if they catch a ball or fall incorrectly. Fingers can be fractured if they are bitten in a dog attack. Phalangeal fractures can also occur when someone has an accident when using heavy hand and power tools. These fractures are also especially common in children, who can fracture their finger while playing. When a patient presents with a possible phalangeal fracture, their hand specialist will examine the affected digit and likely order an x-ray to better visualize the injury. With a better view of the type of fracture they have, the doctor may recommend splinting and rest or straighten the bones using local anesthesia. If surgery is required, it is typically a same-day procedure using regional or local anesthesia, during which the fracture is reduced (aligned) and internally fixated so that post-accident mobility can be maximized. At HandSport Surgery Institute, surgery is typically not our first option. Whenever possible, our team will follow a conservative treatment plan. However, due to the importance of our fingers, surgery may be recommended when the injury is too severe or if a patient’s dexterity and comfort may be further compromised without intervention. Please contact us as soon as possible to schedule an appointment with our talented team. Call Dr. Mark and Jason Pruzansky at 212-249-8700 to schedule an appointment, obtain an accurate diagnosis, and start the healing process for phalangeal fractures so that you can get back to the activities you enjoy.